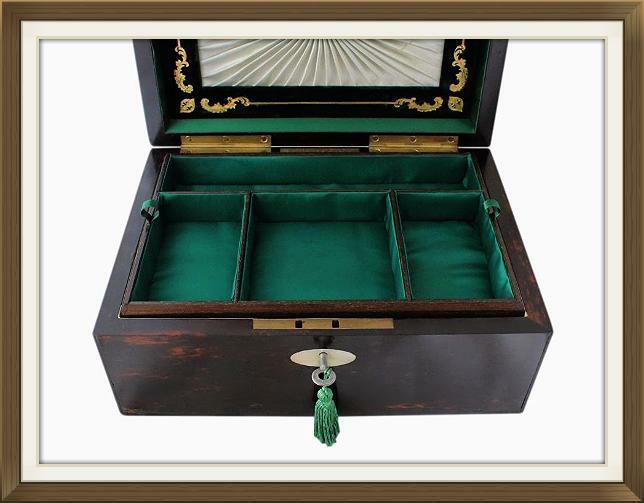 This is a superb high quality Victorian jewellery box, dating to 1860/70. It has a beautiful partially refurbished interior and is complete with its original lock and key. It was retailed by the renowned Mappin Brothers firm, further details of which are below. 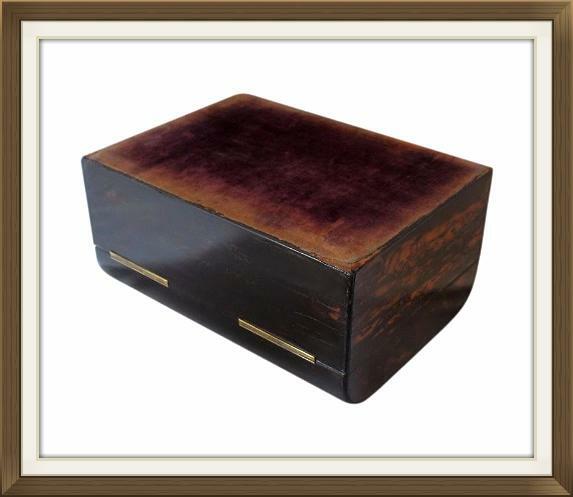 This box has a stunning dark Coromandel veneer, further details of which can be found below. There is a simple yet stylish, oval Mother of Pearl cartouche on the lid, plus a matching Mother of Pearl escutcheon to the keyhole. These are inlaid, set flush into the veneer. The box is complete with its original large hinges. These are high quality solid brass 'stop' hinges which prevent the lid from falling back. The box is also complete with its original solid brass working lock, and its original key. MAPPIN BROTHERS. 222 REGENT STREET & LONDON BRIDGE. Retailers plaques/stamps are a sign of high quality. The bottom of the box has its original soft violet baize covering. Coromandel is a valuable rare exotic wood from South East Asia and Sri Lanka (Ceylon). Sadly Coromandel has been logged to extinction over the last 2 to 3 hundred years. 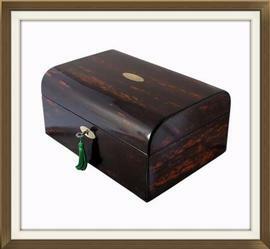 The use of Coromandel on boxes and furniture is always a sign of quality. The Victorians loved Coromandel wood but it was so expensive that they often only used it on the lids and fronts of boxes. This particular box has it veneered all over. Coromandel wood was referred to in Dame Edith Sitwell's poem 'Black Mrs Behemoth', likening its grain to that of a 'rolling curling smoke of a blown out candle'. This box has a beautiful partially refurbished interior. All of the refurbishment was carried out by our skilled box Restorer, who you can read about by clicking the link further down. The inside of the lid has its original documents folder, as shown on image 5 above. In the bottom of the box is a new hardwood storage tray, above the original large compartment beneath. Both of these have beautiful new linings. This can be used to store treasured photos and letters, and/or private documents. There is a beautiful panel to the front of this folder which is extremely decorative. It has a pleated silk centre and a soft brushed velvet frame. The silk is a lovely pastel mint green colour. 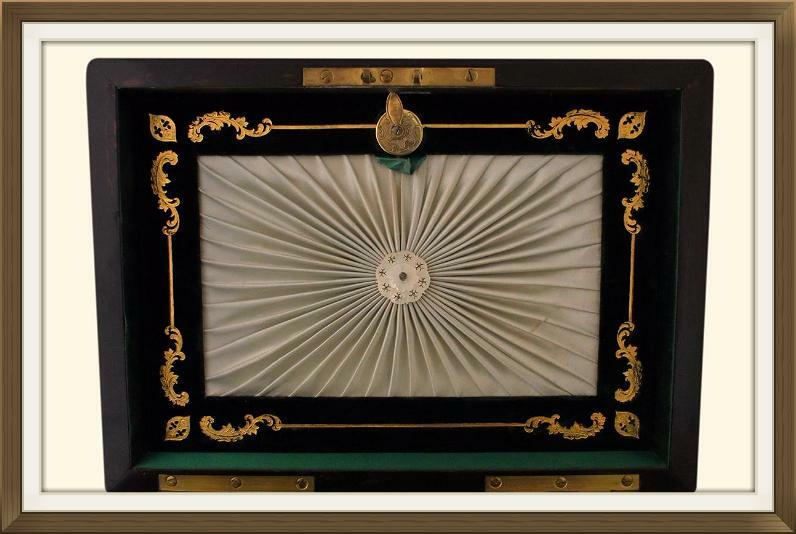 It has a beautiful Mother of Pearl disc in the centre which has pierced decoration, and a green silk pull tab. The velvet is a deep emerald green colour and has superb embossed gilt decoration. The top of the panel has a solid brass disc with a dial clasp. This has beautiful engraved decoration. You slide the dial clockwise to release the folder. The walls to the inside of the lid have their original green silk linings. This matches the silk pull tab. The folder itself is made of grey card and is complete with its silver foiled card backing. The same foiled card is on the inside of the lid behind the folder. The sides of the folder are made of strong textured dark green paper. This is a new French Polished and stained tray with multiple storage compartments. The bases of the compartments have new padded silk panels, and the interior walls have matching new silk linings. The silk is a beautiful emerald green colour. 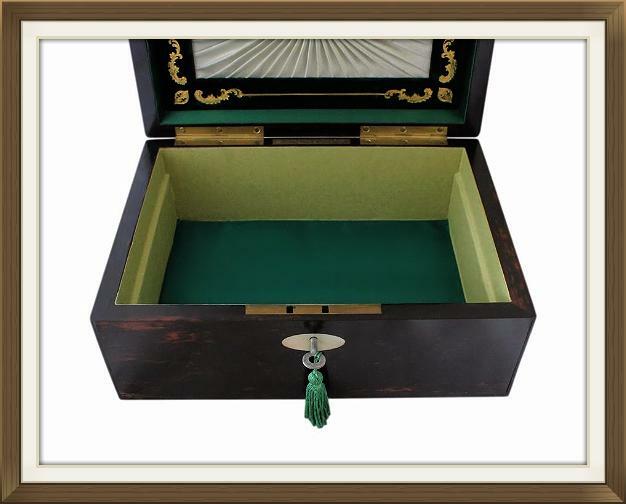 The rear compartment is the ideal shape and size for holding necklaces and chains. The front three compartments are ideal for bracelets, brooches, pendants, rings and earrings. The tray has lovely green satin pull tabs, and the bottom of it has a new green felt covering. This has a new padded silk panel in the base which matches those in the tray. Its walls have new apple green paper linings. This is a good quality textured paper. The compartment is deep and very spacious. It will store a vast amount of jewellery, including big pieces such as bangles, watches and beads. 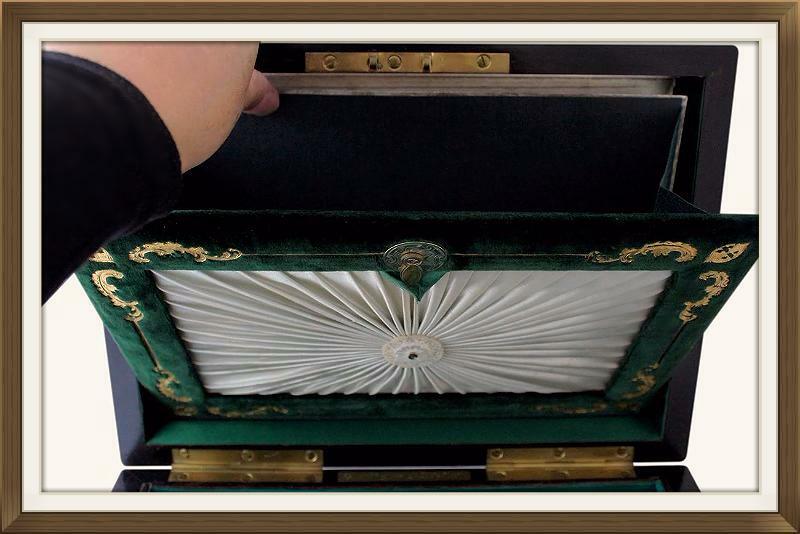 This box was retailed by the renowned Mappin Brothers firm who are the forerunners of Mappin & Webb. Mappin & Webb are still in production today, making quality silver and silver plate goods. The Mappin Brothers firm was founded in 1810. Printed information about Mappin Brothers will be sent along with the box. This super box is in wonderful condition for its 140/150 years of age. The veneer has some surface hairline splits which is not unusual on a box of this age. These are not overly noticeable or unsightly and do not affect the sound structure of the box. The Mother of Pearl inlay is still beautiful and firmly set. There is fading and minor wear to the violet baize covering on the bottom of the box. The box locks securely and the hinges are in perfect working order.. There is minor wear to the interior panel of the folder. The new satin and paper linings are in excellent condition. There is some slack/minor rippling to the padded silk panels in the tray. Please ensure the lock is working as soon as you receive your box. 11.0 by 6.3cm with a 3.0cm depth. 11.0 by 10.3cm with a 3.0cm depth. 24.0 by 4.2cm with a 3.0cm depth. 24.5 by 17.5cm with a 5.3cm depth. (8.0cm depth if tray is not in situ). International Postage is by Royal Mail International Signed For post. Delivery is fast, within 3-5 working days to Europe, and 5-7 working days to the rest of the world. For Vintage and Antique Jewellery please visit our sister site via the links below. Enjoy £10 off your 1st order plus FREE next day delivery within the UK. Valid for both single and multiple purchases. Please see our website for details.